The new Razer phone has arrived. At the end of 2017, gamers went crazy for the Razer Phone. It was the first smartphone to offer a 120Hz refresh rate, and for many, it signalled an end to buffering and frustration. Fast-forward a year and Razer Phone is still the only smartphone out there with this 120Hz refresh rate. In fact, the only other devices that offer this is Apple’s current iPad Pro line-up. But not for long, because there’s a new Razer Phone on the scene. And it’s here at Three with an exclusive Xbox Games Pass. Bring it on! Introducing the all-new Razer Phone 2. With up to 30% increased performance compared to the original Razer Phone, Razer has improved the hardware within the phone, along with the way in which the inner tech is cooled. The Vapor Chamber Cooling system is brand new and no other smartphone has it. Put simply, no matter how heated your gaming gets, you can be sure your phone will keep its cool. The improved battery performance is pretty impressive too and offers up to 10 hours’ battery life when you’re playing games at 120hz. Wow! The new Razer Phone has a 5.72 inch LCD touchscreen display with a resolution of 1440 pixels by 2560 pixels. And the 120Hz screen makes a welcome return, giving you super-smooth gameplay that you won’t find on any other smartphone out there. The screen is the same as the original Razer Phone, so you can be sure your games and movies will look as good as they perform. Razer Phone users, be the first to experience all Razer Cortex on mobile has to offer. Discover a curated list of popular mobile games, be able to launch them quickly and optimize settings across all your game titles. Get ready to max out the way you play—all in the palm of your hand. You can also make the most of features such as Game Booster, which is a tool that lets you tweak the frame rate, clock speed, and other settings of individual games to give you the best balance between performance, visuals, and battery life. The design is pretty similar to last year’s Razer Phone, but there are some awesome updates. It’s nearly the same size as Razer Phone, measuring at 158.5 x 78.99 x 8.5mm but there are slightly thinner bezels above and below the screen which house the speakers. Razor Phone was known for its awesome audio and in online reviews it’s competed with some of the most premium devices in terms of sound. So, it seems that Razer Phone 2 won’t disappoint in this area too. High-quality speakers with their own dedicated amplifier are par for the course, making it perfect for gaming sessions, music streaming and binge watching. The 8MP f/2.0 front-facing camera and flash sit at the top of the Razer Phone 2 and there’s no notch or 3.5mm headphone jack. Instead, you get a USB-C port with a 25Bit DAC. The back of the phone is made of glass so that is can facilitate the nifty wireless charging. The glass is Gorilla Glass 5, which has improved durability compared to the Gorilla Glass 3 that was used in the screen in last year’s Razer Phone. If you’re not a fan of glass, don’t worry, Razer is apparently working on a matte alternative that’s coming “at a later date”. Of course, when it comes to gaming you need RGB lighting and the new Razer Phone is powered by Razer Chroma which is a world-renowned RGB lighting system. You’ll be able to customise the light-up logo on the back of Razer Phone 2 and set it up in your own preferred style and colour. Razer have upped their game and improved the rear camera system on the new Razer Phone, compared with its predecessor. It comes with a dual-camera system that’s made up of a wide 12MP f/1.75 lens and a 12MP f/2.6 telephoto lens with OIS that gives you 2x zoom. Plus, you get optical image stabilization and a dual LED flash. It can also record super high-quality 4K video. The wireless charging is super-handy and because Razer Phone 2 is rated IP67 for water resistance you get the added peace of mind when you’re out and about in all weathers. It’s also good to know that the new Razer Phone has also been officially certified by Netflix for HDR video content, and Dolby Surround 5.1 audio content too. If you get your Razer Phone 2 on Three you’ll be able to enjoy unlimited streaming with Go Binge , so you’re guaranteed a stunning, stress-free experience as you download all the latest Netflix movies and shows. We’re offering the new Razer Phone with an exclusive gaming deal. Simply buy Razer Phone 2 on Three on a 12GB or over plan, and you’ll get a 6-month free trial of the Xbox Game Pass. It’s a subscription service from Microsoft that gives you unlimited access to over 100 Xbox One and Xbox 360 games on Xbox One. Play new games like Forza Horizon 4 and State of Decay 2, as well as Crackdown 3 on the day it’s released (hold tight until February 2019 for that one!). Plus, discover and download titles you’ve always wanted to play or revisit favourites that you’ve been missing. 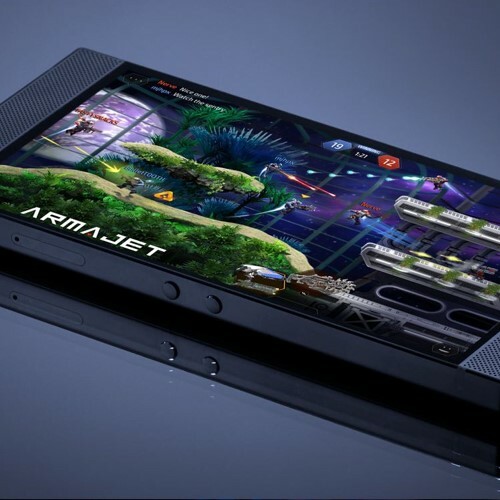 There’s no doubt about it, with Razer Phone 2 on Three there’s some serious entertainment to be had. Roaming and Brexit: what's the deal?